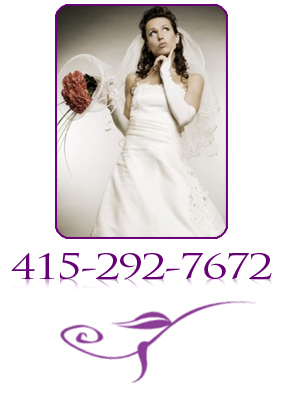 SAN FRANCISO'S FAVORITE WEDDING OFFICIANT! Why is A Perfect Wedding Ceremony so popular? 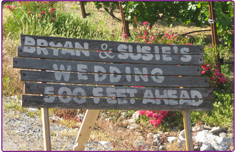 I am the one of the Most Requested Officiants in San Francisco, East Bay, South Bay, North Bay, Sonoma and Napa. I am Professional, Personable and Dynamic. I make words come Alive! I perform ceremonies for ALL couples who have declared their desire to marry. Many churches have restrictions and requirements for couples to marry, I have none. I specialize in non-denominational, traditional, non-traditional, secular, non-secular, civil, interfaith, religious, non-religious, themed, custom and personalized, simple, short and sweet wedding ceremonies. I have excellent references. I am committed to create and perform A Perfect Wedding Ceremony tailored for your special day. The Ceremony Package Donations are set and designed to offer you the finest Wedding Officiant Services Available, at an affordable discounted price. Please visit my Facebook Page, so that you can see a few of the experiences of joy that I can bring to your wedding day. How do we Reserve A Perfect Wedding Ceremony? Email us at mark@aperfectweddingceremony.com as soon as you have finalized the REQUIRED ITEMS-Both Parties-First and Last Names, the exact date, exact time, your contact number, the number of guest, the ceremony package that matches the dynamics of your wedding and the exact ceremony location, so that I may evaluate the driving pattern to and from your wedding and to review my calendar of availability for your desired wedding date and time. Please include the number of bridesmaids and groomsmen. Once we receive the Required items and availablity is confirmed, a 50% retainer deposit is required. Retainer payments-We will email you an invoice to be paid online with any major credit or debit card or PayPal Account. When the retainer is paid, within 24 hours you will receive an email ceremony reservation confirmation, including the next step. Next steps are determined by the ceremony package that matches the dynamics of your wedding. Yes, Ceremony dates and time are reserved on a first come first served basis with payment of a 50% retainer deposit of the total donation. Once I have determined that I am available to perform your ceremony on your wedding date and time, a 50% deposit is required. We use convenient online payment for All Retainer/Reservation payments. The terms and conditions of service are included on the invoice/agreement. We will email you an invoice to be paid online with any major credit card or PayPal Account. Payment of the invoice secures that the terms and conditions of service have been read and accepted. When the retainer is paid, within 24 hours, we will email you a ceremony reservation confirmation. The Next steps following payment of the retainer are determined by the ordered ceremony package that matches the dynamics of your wedding. The remaining balance is due paid upon my arrival to the ceremony site. Do you have a Service Agreement that we must sign? Yes, I have a short, concise service agreement that I ask all couples to review. The terms and conditions are listed on the invoice. Your payment of the retainer confirms that you have read and accepted the terms and conditions. The terms and conditions are straightforward and outline my responsibilities to you, all the details of your ceremony package and the terms of our agreement. The terms and conditions of service is designed to establish a clear written understanding of the scope of my services for your wedding. A SAMPLE Terms and Conditions can be viewed here. What do we do to obtain our marriage license? A Perfect Wedding Ceremony does not issue marriage licenses. Marriage licenses in San Francisco are issued by appointment only. Appointments are available on-line at "Online Marriage License Reservations." Appointments can be made up to 90 days in advance. Both parties must appear in person and bring valid picture identification to San Francisco County Clerk City Hall, Room 168, 1 Dr. Carlton B. Goodlett Place, San Francisco, CA 94102-4678 to obtain your marriage license at your appointment. Outside of San Francisco County: You may obtain your Marriage license from your local County Recorders Office, Anywhere within the State of California. OR Google Marriage License in the county where your ceremony will be held and read all the information regarding marriage licenses. Will you help us find a venue/location for the wedding? I am not usually involved in the venue/location planning process of your wedding. I have listed some of the venues and locations where I have performed ceremonies on the website. I suggest that you have fun as a couple, researching a location/venue where you would like to be married. Once you have finalized the location for your ceremony/wedding, if available, I will perform the ceremony wherever your hearts have landed you! Do you perform religious ceremonies? My practice is Non-denominational. 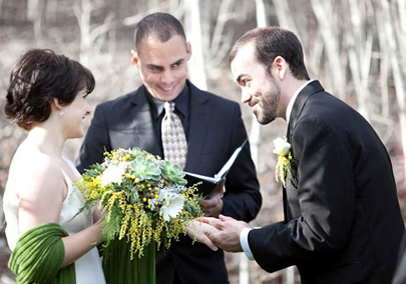 Civil Ceremonies do not include any "Religious Content or "Dogma" of the church. When you select the Custom Package, I will only include as much "Religious" content as you wish. Please Note: The flexibility to incorporate Religious Content, Spiritual Elements, Special Readings, Rituals and Cultural Traditions are options only available with the Custom Ceremony Package. May we share our own vows? Yes, creating your own vows tailors the love and commitment between you and your loved one and personalizes the ceremony. The Custom Package includes Optional assistance with your personal vows. 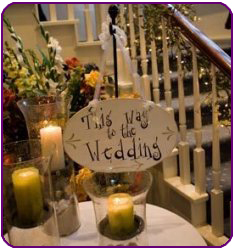 Simple and Sweet and Custom Ceremony Packages Only-You may arrive with your personal vows on the day of your ceremony, if you so choose. I will wear a dark suit with a tie. If you desire casual attire, I will wear dress slacks, button down shirt and a nice jacket. If your wedding is formal, I will wear a black tux. If you prefer a robe, I will wear a black Minister's robe and a stole. If you are having a themed wedding and wish a specific style of dress, just let me know and we can arrange a style of dress that fits within the style of your theme. Do you travel outside of San Francisco County? Yes, I proudly serve San Francisco, East Bay, South Bay, North Bay, Sonoma and Napa. All Ceremony Package Donations include travel up to 60 miles. Any ceremonies or rehearsals over 60 miles (round trip) will be charged $1 per mile round trip. Will I need a witness for the ceremony? Yes, you will need one witness for a Public Marriage. If you do not have a witness, I can provide a witness for an additional donation of $35 each. Please give me an advance notice so that I can make arrangements with the witness to be present. Confidential Marriage License do not require a witness. Do you have back up in case something happens on the day of our wedding? Yes, I am pleased to say that I have never missed a ceremony. In the unlikely event that I am unable to perform the ceremony, I will use a qualified replacement to perform the ceremony, if time and resources permit. Below are some of the venues and locations where I have performed ceremonies! Alameda, Albany, American Canyon, Antioch, Aromas, Atherton, Belmont, Ben Lomond, Benicia, Berkeley, Bolinas, Brentwood, Brisbane, Burlingame, Calistoga, Campbell, Capitola, Carmel-by-the-Sea, Castro Valley, Ceres, Clayton, Cloverdale, Colma, Concord, Corte Madera, Cotati, Cupertino, Daly City, Danville, Del Rey Oaks, Dillon Beach, Dixon, Dublin, East Palo Alto, El Cerrito, Emeryville, Escalon , Fairfax, Fairfield, Felton, Foster City, Fremont, Gilroy, Gonzales, Greenfield, Half Moon Bay, Hayward, Healdsburg, Hercules, Hillsborough, Hollister, Hughson, Inverness, Inverness Park, Kentfield, King City, Lafayette, Lagunits-Forest Knolls, Larkspur, Lathrop, Livermore, Lodi, Los Altos, Los Altos Hills, Los Gatos, Manteca, Marina, Marshall, Martinez, Menlo Park, Mill Valley, Millbrae, Milpitas, Modesto, Monte Sereno, Monterey, Moraga, Morgan Hill, Mountain View, Muir Beach, Napa, Newark, Newman, Nicasio, Novato, Oakdale, Oakland, Oakley, Olema, Orinda, Pacific Grove, Pacifica, Paicines, Palo Alto, Patterson, Petaluma, Pidemont, Pinole, Pittsburg, Pleasant Hill, Pleasanton, Point Reyes Station, Portola Valley, Redwood City, Richmond, Ridgemark, Rio Vista, Ripon, Riverbank, Rohnert Park, Ross, Salinas, San Anselmo, San Bruno, San Carlos, San Francisco, San Geronimo, San Jose, San Juan Bautista, San Leandro, San Mateo, San Pablo, San Rafael, San Ramon, Sand City, Santa Clara, Santa Cruz, Santa Rosa, Saratoga, Sausalito, Scotts Valley, Seaside, Sebastopol, Soledad, Sonoma, Soquel, South San Francisco, St. Helena, Stinson Beach, Stockton, Suisun City, Sunnyvale, Tiburon, Tomales, Tracy, Tres Pinos, Turlock, Union City, Vacaville, Vallejo, Walnut Creek, Waterford, Watsonville, Windsor, Woodacre, Woodside, and Yountville.